The history of efforts to address global health issues has traditionally been framed as a problem of stopping the spread of epidemic diseases. The issue has been seen as stopping diseases from “them” (those in the developing world) from affecting “us” here in the industrialized west. 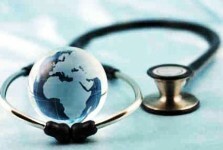 The first effort to establish international health governance took place in 1851. The nation of France convened a conference of 11 European states, plus Turkey, to establish uniform quarantine regulations to prevent the importation of cholera, plague and yellow fever. The meeting, known as the First International Sanitary Conference, produced no agreements and adjourned after six months of squabbling. However, it did establish the principle of international cooperation to address health issues and 13 more such meetings followed. By the beginning of the 20th century, a single International Sanitary Convention was adopted by the participating nations and a permanent standing organization headquartered in Paris was established. Mid-century saw the establishment of The World Health Organization (WHO) as an integral part of the United Nations (U.N.). Still, the concept of global health revolved largely around questions of infectious diseases in the developing world. These efforts continue – and rightly so. However, the epidemiological world has changed. When I was teaching Global Health, I invited a local physician to speak to the class. Now practicing in Virginia, the physician had been born in the Democratic Republic of the Congo (DRC). Twice a year, he returned to his homeland to bring supplies and run a clinic. When I asked him what kind of cases he saw in Congo, he listed diabetes, heart disease, high blood pressure – the same things he treated in Virginia. The data support his experience. The leading cause of death globally is heart disease, accounting for over 17 million deaths per year. Cancer accounts for over 7 million. Tobacco use is nearly 5 million while obesity is 2.6 million and high blood pressure over 7 million. Nearly 400 million people will die of a chronic disease in the next 10 years. But those deaths are not where you might expect them to be. At least 70%-80% will occur in low to lower middle-income countries – countries where the gross national income (GNI)/capita is $875-$9,999. Over 80 percent of cardiovascular and diabetes deaths and over 90 percent of those from chronic obstructive pulmonary disease are in those same countries. Africa, Asia, Central and South America account for 70 percent of all cancer deaths, and the global incidence of cancer is increasing logarithmically. Eighty percent of all diabetes deaths occur in low to lower middle income countries. But this is not just about mortality statistics. People in the developing world acquire these diseases a decade or more before we do. Not only do they die younger, they become less productive in what should be their prime working years, which is a problem for them and their countries. As nations adopt Western lifestyles, their populations begin to develop the diseases associated with those lifestyles. Now the transference of disease is going the other way. They have become “us” and we have become “them.” It might be argued that people are now just living long enough to get diseases associated with aging. But there is ample evidence to demonstrate that high blood pressure, diabetes, etc. are not caused simply by aging. It might also be argued that people should be free to adopt whatever lifestyle they please. If disease is associated with that lifestyle that’s a risk they choose. However, they don’t choose it. Their countries urgently need to engage in trade to survive economically and international trade agreements mean that they must accept floods of processed foods and tobacco products into their domestic markets. Tobacco alone has been identified as the leading cause of preventable deaths on the planet. How many deaths is that? A billion expected in this century. Eighty percent of the world’s smokers are in low and lower middle-income countries. Stores full of the same tasty blends of salt, fat and sugar are replacing traditional markets full of local produce. Fast food is widely available too. YUM brands, for example, opens a KFC store every single day in China alone. The results are not surprising. WHO estimates that 3 billion adults will be overweight or obese by the end of this year. Overweight is a contributing factor for many chronic conditions. Up to 90 percent of Type II diabetes is believed to be attributable to excess weight. This situation seems unlikely to change any time soon. First, unlike diseases such as AIDS or the Ebola virus, chronic conditions elsewhere do not appear to be a threat to us. With nothing to fear, we are hardly likely to put resources into heart attacks in India rather than heart attacks in Cleveland. Second, the situation is profitable. Transnational tobacco companies, agribusinesses and food production companies make billions from selling their products to poor people. Third, their health care systems are not up to dealing with these conditions. Remember my doctor from DRC? I asked him how he treated the patients in his clinic visits. He said he gave them enough medicine to last a while. I asked what happened when the medicine ran out. He gave me a look somewhere between exasperation and resignation and said that then they didn’t have any more. That is the problem for large numbers of people with diabetes, high blood pressure, etc. in poor countries. Unless a caring doctor from a rich country drops in with medicines, treatment is hard to come by. As for the global health community, they are coming late to this issue. WHO issued a Framework Convention on Tobacco Control only in 2003. We are now nearly three years out from a U.N. summit convened to address noncommunicable diseases with no clear results in sight. My greatest source of hope is that the floods of students being graduated by global health programs may turn their attention to the tsunami of chronic disease that has now spread to all corners of the planet. Perhaps they will come up with better solutions than suggestions to eat right and exercise more. It hasn’t worked well for “us.” I doubt it will work for “them” either.